The mission of the Prairie Band Potawatomi Nation Housing Department is to provide affordable housing options for all tribal members through the administration and operation of the Rental Housing Program and through research and development of new programs so as to reduce the number of tribal members who reside in substandard housing and to assist tribal members who wish to improve their standard of living. The Housing Department is open Monday through Friday from 8 a.m. to 4:30 p.m. and is staffed by a director, property manager and other office personnel. In addition, the Housing Department works closely with the Building Maintenance department which assists in maintaining all tribal housing that the tribe is responsible for. Maintenance is not available for any non-tribal owned property. 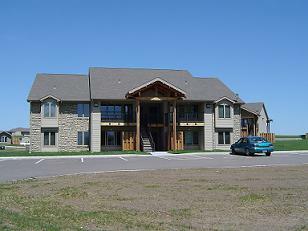 Tribal owned property includes the apartments, senior housing, rentals and land acquisition homes. Requests for applications can be requested via phone call, mailed written request, email request or may be downloaded here. PBPN Housing provides three types of housing options for tribal members: Rental, Senior Rental, and Rent to Own. Note: Anyone that fills out an application for homes rented ON the reservation needs to make sure changes are updated with the Housing office at least once a year. This includes: address, income, household composition and your contact information. For more information please call the Housing office at 785.966.2756. 16 apartment units ranging in size from 1- to 3-bedrooms with on site access to coin-op laundry facilities. 4 single-family units with 3 bedrooms. 30 units acquired through tribal land acquisition purchase. These homes vary in size from 1- to 6-bedrooms. 15 Low-Income Tax Credit Housing 2-bedroom apartment units with access to free on-site laundry facilities and a therapeutic whirlpool/spa.